I beg to differ. Yes, the daily act of streaming music isn’t special. But then neither was that random Shed Seven album you bought to make up your ‘3 for £30’ offer in Our Price. But sometimes streaming music will give us memorable moments to treasure, we just have to give it a chance. 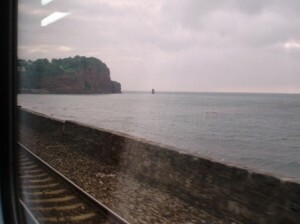 I’m on the train to London from Cornwall, and I just passed the fabled Dawlish Sea Wall near Teignmouth, a stretch that hugs the sea for 15 minutes. It’s beautiful, particularly with the melancholic rain pouring down. I checked my Spotify inbox to find my wonderful girlfriend had sent me ‘Myth’, the new song from Beach House, with a lovely message. Listening to it like this was a gift, a fitting moment that will always be associated with the song. It was special. So yes, this first play was very different to settling in with Steve Lamacq on a cold night in 1998, waiting with anticipation for the return of your favourite band. But was it less special? Hell no. The fluidity of 21st Century music will make it special in ways we’ve never imagined. I can’t wait. Streaming Music : What Are The Options?